At times, your car may feel like an extension of your home. You can relax, listen to your favorite tunes and sing along to the music. Driving feels like freedom. But with that freedom, comes responsibility. You need to take care of your car and make sure it is safe. Airbag? Check. Seat belt? Check. All lights and windshield wipers in working order? Check. Cellphone off? Check. Closed-toe shoes? If you’ve ever driven while wearing flip-flops, you know that they can slip and get snagged under the pedal. This is disconcerting to say the least. It also is dangerous as it can cause unexpected swerves and prevent you from having full control of the car. Your toes are also vulnerable to getting stubbed if you have to break suddenly. The same issues exist with sturdier sandals. There are more points of potential snags on the pedals than with closed-toes shoes, and there are reports of injuries in the unwelcome event of an accident. High heels, whether they are open-toed or closed-toe, are not recommended, either. With this style of shoe, you might find the heel forces your foot into an uncomfortable position and it doesn’t let you plant your foot flat on the floor. When your foot is flat, you can easily move it between the gas and brake, and heels make this much more difficult. Even if you learn to compensate for this, it is advisable to choose other shoes when driving. 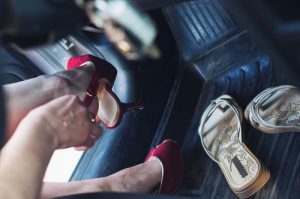 Closed-toe shoes are generally better to drive in than heels or sandals. Your toes are protected and laced shoes are more closely secured to the foot than other types of footwear. However, some closed-toe shoes are better than others. Mens dress shoes have slick soles and this can cause your foot to slip off the accelerator or brake pedal. To solve this problem, you can scuff the bottom of the shoe or find an adhesive grip pad to stick on the bottom of your dress shoes. Hiking boots have plenty of traction, but they can restrict your ankle and interfere with your connection to the vehicle. Shoes with thick soles can make it difficult to determine how hard you are pressing down on the pedals. This is especially true the first time out. If you are driving in new shoes, take a moment before you head out to check how they feel as you press the pedal. The best choice: Shoes with rubber soles and toe caps help with traction so there is no unanticipated slipping. Your toes are protected from accidental bumps or stubs against the pedals.